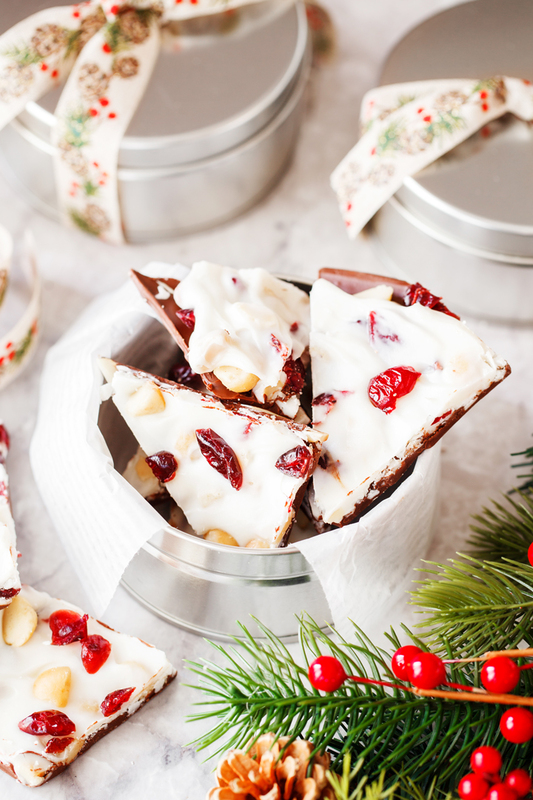 Cranberry Nut Chocolate Bark: a yummy holiday treat perfect for Christmas parties or for gifts. 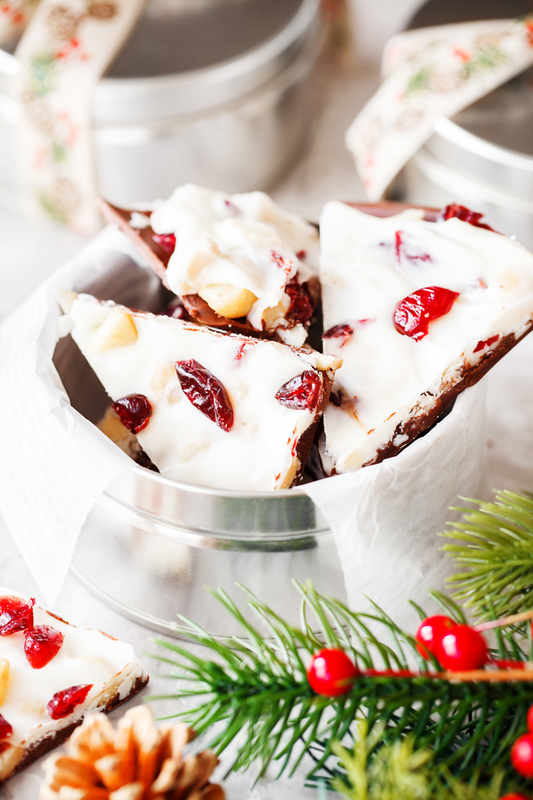 Layers of chocolate, white chocolate, and cranberries makes this a delicious treat to eat! Cookies, chocolate, and confections all make great gifts during the holiday season! 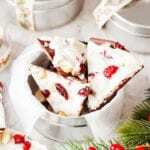 This cranberry nut chocolate is a simple sweet treat to put together and is great to serve at Christmas parties or to package up into treat containers. The layers of milk and white chocolate adds a fun depth of flavor and the cranberries and macadamia nuts adds a delicious crunch. Line cookie sheet with parchment paper or Silpat. 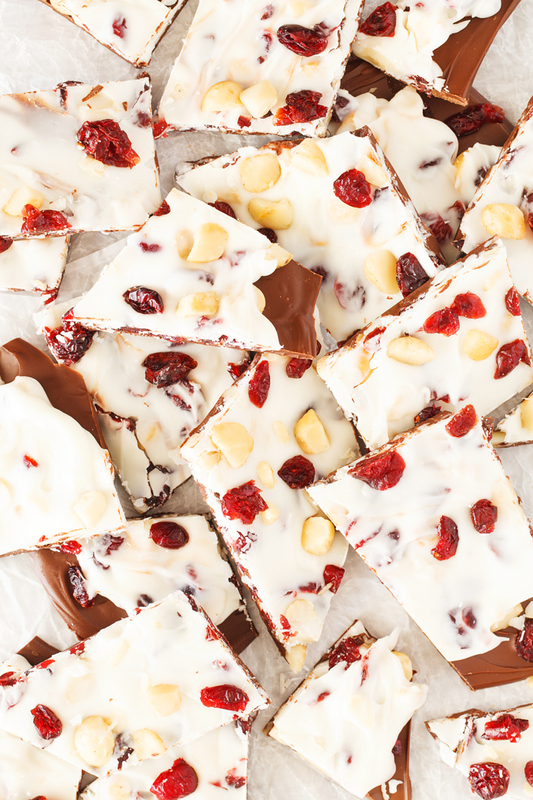 Melt vanilla and chocolate bark according to package directions in separate dishes. Remove from heat and stir ½ cup cranberries and ½ cup macadamia nuts into white chocolate. Spread milk chocolate on parchment paper in a rectangular shape. Carefully spread white chocolate mixture on top. Sprinkle remaining dried cranberries and nuts on top. Place in refrigerator and allow to cool completely. Break into small pieces. Store in air tight container. 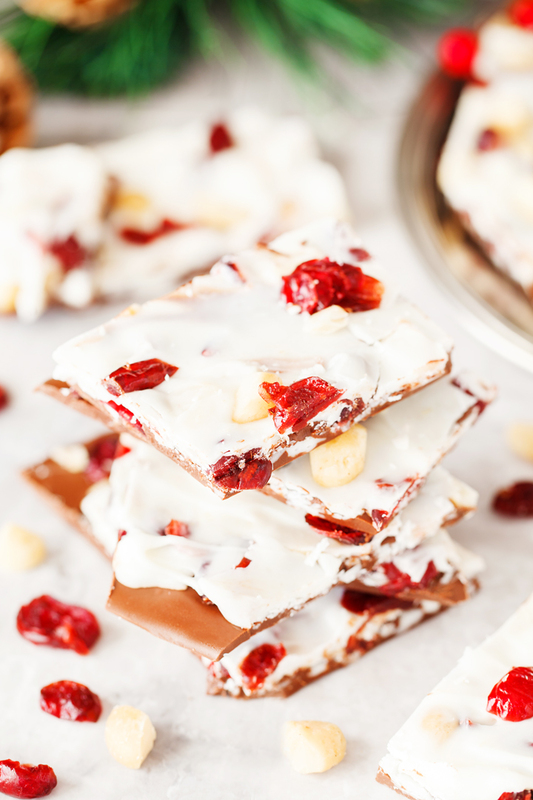 How long will this Cranberry Nut Chocolate Bark last? If stored in an airtight container this cranberry nut chocolate bark recipe should last about 2 weeks. I would personally store this in the refrigerator so the chocolate doesn’t get too soft in a warm kitchen. For more delicious Christmas treats you should give these a try! Sprinkle remaining dried cranberries and nuts on top. Place in refrigerator and allow to cool completely. Break into small pieces. Store in air tight container.